Both Axanar and Discovery (boo!) posit a Federation/Klingon war some years before The Original Series. My question is this. Is there any canonical support for this idea in TOS/TNG/DS9/VOY/ENT? Or is it just one of those things that everybody assumes? I know in TNG Picard said that "Centuries ago, a disastrous contact with the Klingon Empire led to decades of war". But I always assumed he meant it was a cold-war style situation, or maybe ongoing skirmishes and raids, rather than a full on war. Is there anything else in the way of references to such a war? Graham Kennedy wrote: So a question. All out "Congress declares war" war? No, I don't think so. I don't recall anything beyond that conversation, which was absolutely referenced in the old Star Trek encyclopedia from the 1990's when referencing the diplomatic relationship between the two powers prior to Khitomer. 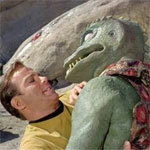 I vaguely remember Mr. Scott saying something about a Klingon war in TOS (Day of the Dove, perhaps?) I may also be confusing this potential Scotty quote with notes from the Star Trek Compendium, because I believe the production notes make reference to the hostilities. I don’t recall an explicit reference to an official war, but in TOS neither side seemed too concerned about the ramifications of using force against representatives of the other. Perhaps a Korea style officially at war but unofficially mostly not bothered beyond chucking a torpedo at one another for fun now and then? I wonder, however, why having a neutral zone between the two powers without a open conflict to request it. With Romulans and Cardassians this area was created just after a war ... so in real life in Korea. Paradoxically it would make sense in the way of fighting seen in DSC, with both powers aware that a new war would lead to annihilation. a war seems needed to have a Neutral Zone indeed. And both Axanar short movie describing the preludes of the Battle of Axanar and Discovery show a war who would need such a Neutral Zone. Starfleet Museum too picture a Klingon - Federation war, almost in same time than Axanar (maybe starting later and finishing in same time). And it was preceded and followed by a lot of skirmish. Way I view it... If it was going to be something in the lifetime of the NCC-1701 (but before Captain Kirk's command, either Robert April's command or Christopher Pike), ST: Axanar is what I'd want to view it with. Not... What we got, or rather, didn't, with STD. So, ignoring both, I'd go with the idea that the Federation and Klingon Empire had such a long history of conflict with no official declaration of war from Archer's time, that eventually something did happen, but instead of declaring war, the Klingon Empire's Chancellor of the time viewed a war as contrary to the needs of the empire, say, unlike the Federation, the Klingon Empire were facing renewed hostility from the Romulans, and needed to avoid hostilities with the Federation, and contrary to Mr Can't Speak Properly who isn't Canon in this idea, the Klingon People know that the Federation aren't as much of a threat if left alone, that Starfleet does have a somewhat compatible sense of honor. Because I'd like more detail on the history of Klingon-Romulan relations. And to avoid these hostilities, someone used the Federation-Romulan Neutral Zone that has been in place since the formation of the UFP, as a marker for how to, avoid, said hostilities. So the Federation-Klingon Neutral Zone is established, and standing orders for it are, any starfleet and klingon imperial vessel encounters within must withdraw, or if necessary to whatever mission is active, remain 'civil'. eventually that part changes, but the essence is there - there's no actual war, but prior to its' establishment, Starfleet and the Klingon Empire have come to blows in the past but not all-out war. which is why klingons CAN be customers at Starbase K-7 for O'Brien and Bashir to comment on, "Those are Klingons?" and not have the Enterprise go "Hey get out of our territory!"